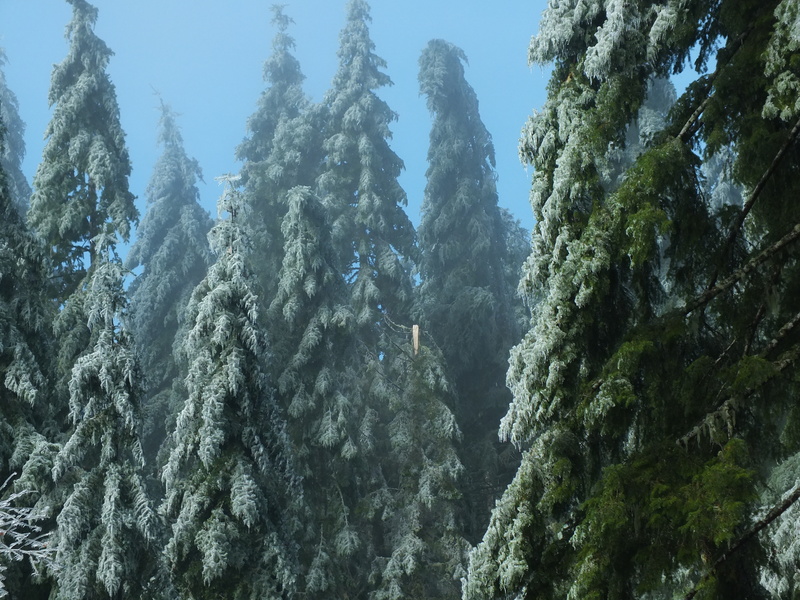 While most residents of the Willamette Valley and Cascades foothills experienced unseasonably cold temperature in mid November, residents and landowners in the central Coast Range endured a serious ice storm. This was not a region-wide storm, but sure packed a punch in certain areas, with some people saying the damage caused may be as bad as or worse than that caused by the infamous Columbus Day Storm. I have not heard of any additional damage from a freezing rain event on December 1. He raises a point worth exploring. While calling an insect “good” or “bad” is a matter of perspective, for the purposes of this discussion let’s assume that “bad” insects are those that cause economic or environmental damage, and “good” insects are those that don’t. The vast majority of insects that inhabit western Oregon forests fall into the “good” category…with a few notable exceptions. One of these “bad” bugs that the e-mailer might have in mind is the Douglas-fir beetle. This time of year, the adult beetles are flying around in search of Douglas-fir trees where they lay their eggs underneath the bark. Their favorite targets are large diameter, freshly downed logs—or standing trees that are weakened from another cause (root disease, soil compaction, etc.). Through the summer and winter, the eggs hatch and the larvae grow as they tunnel around under the bark (this activity is what kills the tree). The following spring, they have become adult beetles, and they fly away in search of new homes. If they can’t find another weak tree or fresh log, they will go after a healthy tree. 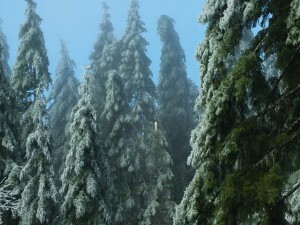 Healthy trees can withstand a low-level Douglas-fir beetle attack, and in normal circumstances there are rarely enough beetles around to cause concern. The problem arises when the beetle population builds up and lots of them infest a healthy tree at once. When does that happen? In situations where there is a lot of freshly downed or damaged wood on the ground for them to target initially – like after a winter windstorm. Here’s a true story for illustration. In fall 2009, a landowner in the Coast Range was hit hard by beetle kill to his otherwise healthy, 100+ year old forest. Why? Here’s how we think this may have played out. The stand is adjacent to a sawmill. 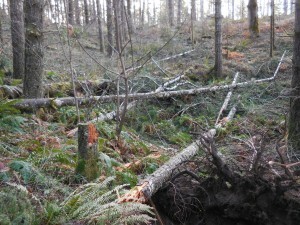 The big windstorm of December 2007 created lots of blowdown along the coast, though this particular stand was too far inland to be damaged. Some of the coastal blowdown was not salvaged until summer 2008…too late, because Douglas-fir beetles had already found them during the spring. The salvaged logs were brought to the mill, along with the beetle larvae living under the bark. Then, in late 2008 the recession hit and the mill curtailed operations. The logs sat in the deck…and the beetles matured. In spring 2009, they emerged and flew off to the neighboring stand, where they attacked the healthy, mature trees. It was a sad situation, especially since the landowner had to cut more trees to avert further beetle damage, and in a poor market. Most insects are not forest health risks. In western Oregon, the Douglas-fir beetle (the “baddest” dead wood-inhabiting insect) only thrives in FRESHLY dead or downed trees. Once the snag or downed wood has been dead for more than a year, it is no longer a target. Instead, it will become inhabited by the dozens of “good” bugs that feed wildlife. There needs a LOT of this fresh down wood to pose a forest health risk – like after a storm. According to Oregon Department of Forestry, a good rule of thumb is that fewer than 3 FRESH down logs/acre does not present a hazard. After a windstorm or other stand-damaging event, yes, prompt salvage is important in order to prevent a beetle infestation. But, when scattered trees gradually die in a stand from other causes, it is hard to imagine when this would create a risky situation with respect to bark beetles. And during harvest activities, you can be strategic about how much dead wood is left behind, and in what conditions. We appreciate it when readers respond to our blog posts. We like your e-mails, but you can also respond by commenting directly on the blog, where other readers can contribute to the conversation.